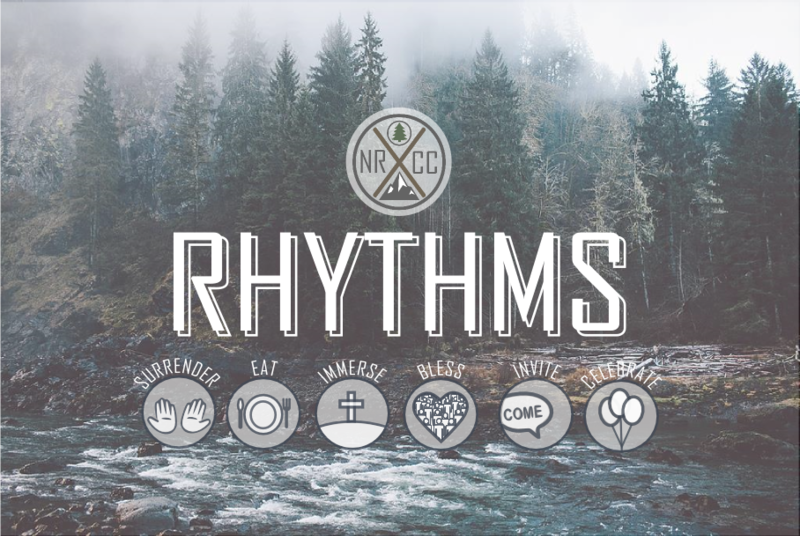 Rhythms do not seek to add more to our schedule but instead the purpose is to live out the simple habits and practices of our lives with Kingdom intentionality. It is an awareness that the Gospel can actually transform the most mundane of tasks to something that has Kingdom significance, even something as simple as eating a meal, or coming together to celebrate, or inviting someone new into our lives or community. Surrender & Trust – We want to regularly die to self, so we can live more fully in Christ (Galatians 2:20). With death there inevitably comes pain. The paradox that comes with following Jesus is that a true, more fulfilling life comes from dying to ourselves so that we can live more fully in Christ. This is one of the hardest practices of any Christian, but with it comes incredible freedom! We want to regularly practice surrendering the parts of our lives that we are clinging to and trusting them to Jesus. We want to walk by faith, and not by sight (2 Corinthians 5:7). Immerse – We want to be a people shaped by the Gospel and God’s word (Romans 12:2; 2 Timothy 3:16). There are many things in life that can shape our story, so we want to actively and intentionally pour the Gospel over every nook and cranny of our life so that we are folks shaped by the Gospel. One way we can do that is to preach the Gospel to ourselves and to one another. And by reading over God’s word as a regular rhythm of our lives. As we do this regularly both individually and communally, we allow the beautiful truth of Gospel to shape our lives inside and out. Celebrate – We want to regularly remember, share and celebrate the goodness of God (Psalm 145:3-7). While we may look down on Israel for their grumbling and their constant forgetfulness of God’s goodness and provision, we often fall into the same pattern if we are not actively celebrating the goodness of God in our lives. This means we are taking time as a community to tell the stories of God’s faithfulness, his blessing, his provision and even his painful pruning. We need to be people who consistently mark our days with the celebration of our Good Father in Heaven, otherwise a stressful, painful, distracting world can cause us to forget. Eat – We want to reclaim this ancient rhythm of community as we regularly share meals with the lost and with one another as believers (Luke 15:1-7). We believe that we need to take back the table in our culture as a place where life is shared. We want eating to be a space where the lost and broken are invited in, and where we can share our lives with fellow believers. In Jesus’ day the table was known as “little temple” because of the social prominence it held in their culture. That is why when Jesus ate with sinners the self-righteous were up in arms. This is a tangible way to seek community, reach out to our city whether it is meal shared at home or in a public place. Bless – We want to regularly acknowledge the needs of others and intentionally bless them in both word and deed–even those who are against us (Matthew 5:43-47). We believe that God desires His people to be a blessing to others. First and foremost because we believe that Jesus Christ is the ultimate blessing to the nations, but also because Jesus’ teachings focus heavily on how we treat our neighbor, the poor and sick and even our enemies. If we live in light of his teachings, then blessing others will inevitable be a part of our individual and communal rhythm. So we desire to regularly acknowledge the needs of others and go out of our way to bless those around us each week. Invite – We want to regularly invite others into our lives, and into a relationship with Jesus where true life change can happen (John 1:39). We believe that the Gospel is fundamentally relational. That is, the good news of salvation in Jesus Christ is communicated most effectively in a natural, everyday setting as we do life together. Jesus modeled this approach during His three and a half year earthly ministry. He invited folks into His life no matter where they were at. In fact Jesus invited many people who were considered low-lifes in his society to eat with him, to walk with him and to learn from him. Jesus came to save sinners and it started with an invitation. “Whoever desires, let him take the water of life freely” (Revelation 22:17). We want to reflect this characteristic of Jesus in our lives tangibly so we regularly invite others into our lives, and into a relationship with Jesus where true life change can happen.